When we returned to our home in Troy, New York, after being evacuated during Tropical Storm Irene, everything on the first and second floors looked pristine, untouched. But just below us sat four feet of water. Everything we hadn’t moved out of the basement was submerged: tools, Christmas ornaments, water heater, furnace, washer, and dryer. A hard-shell guitar case floated near the stairs, bumping into the red Igloo cooler we take to drive-in movies. My canning jars were covered in silt; cardboard boxes had collapsed into sludgy islands. The whole place smelled like a nursery for black mold: damp, earthy, fetid, with a hint of ozone from the storm that left a metallic taste on the tongue. I could hear the water lapping up against the walls. 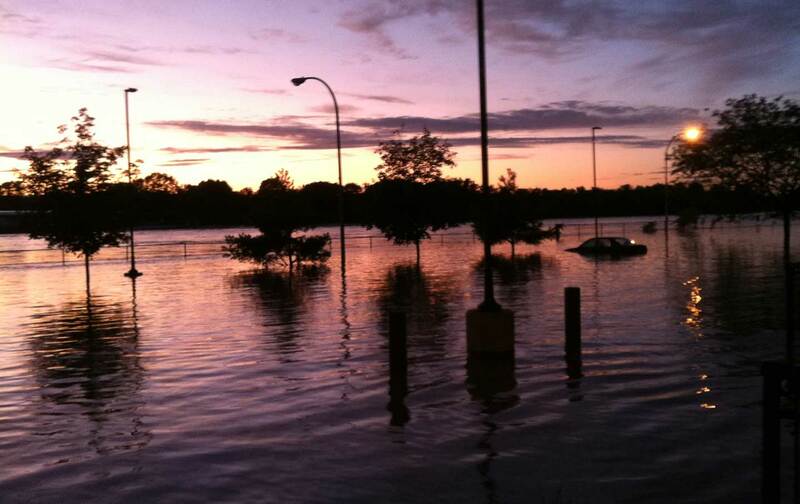 Troy floods. It has since before the Dutch arrived. I didn’t know this when I bought my house. I bought it because the chiming, rippling Poesten Kill canal runs through the backyard; because it has rusty old tin ceilings; and because I wanted to be a member of a vibrant, diverse urban neighborhood that comes together in summer evenings. The 19th-century brick building was a bit worse for wear. It had two stories, an extra lot next door for gardening, two off-street parking spots, some rot in the joists, and serious masonry damage. It cost $75,000. When I realized that the property was in a floodplain, I hesitated and asked around. Friends, real-estate agents, and neighbors assuaged my fears: It’s a 100-year floodplain, they said—and look at the height of those canal embankments! You’ll be fine. We were buying the house without a bank mortgage; family members fronted us the cash and would collect a monthly mortgage payment to supplement their retirement. We weren’t legally required to have flood insurance, and we couldn’t find enough money in the budget for it anyway. So we decided that we would take our chances. We were thinking how lucky we were to find a neighborhood we liked and could afford. We weren’t thinking about climate change. My neighborhood, South Troy, has always housed the city’s working-class families. In the 19th century, neighborhood men were skilled ironworkers, laboring at the Clinton Stove Works and the Burden Iron Works. The women of South Troy worked downtown, sewing detachable shirt collars or cleaning and starching them in the bleacheries along the river. Lively neighborhoods—mostly Irish, Italian, Polish, and Ukrainian immigrants, but also communities of free blacks and fugitive slaves—spread out from the factories. Abolitionism and trade unionism boomed as muddy streets and brick row houses expanded along the river. A hundred years ago, a 30-foot-high cement seawall was built along the Hudson River at Troy to allow ocean-going vessels to transfer their cargoes to barges bound for the nearby Erie and Champlain canals. In addition to expanding commercial waterway traffic, the seawall was intended to prevent destructive floods. The last time the seawall had any real maintenance was nearly four decades ago, and since then the structure has been significantly undermined. Ice and debris have eaten away at the cement; there are holes big enough to shove both fists in. They whistle as the tidal Hudson ebbs and flows. Troy is a long, skinny city hugging the eastern shore of the river, but the seawall protects only the city center. Its crumbling span begins two blocks from my house, at a fishing pier used by neighborhood guys casting for striped bass and herring. Heading north, it skirts a yard full of train cars carrying grain and livestock feed. It passes our rapidly gentrifying downtown, with its high-tech start-ups, terrarium store, and bespoke beer-tasting room. It ends at a $100 million waterfront-redevelopment area called the Hedley District. Beyond the wall’s north end lies North Central, the city’s traditionally African-American enclave, where half of all families live in poverty. A mile past the northern end of the seawall are the Arnold E. Fallon Apartments, the only public housing available in the neighborhood. If you go a bit farther, you’ll come to a row of mobile homes. Across the street from the house where Herman Melville wrote his early books Typee and Omoo sit four single-wide aluminum trailers, in various subdued colors—forest green, gray, shingle brown—right on the bank of the river. They have tiny, raised flower gardens, picket fences, flags, single-car driveways, and white metal mailboxes. This is where Ted Carter lives with his dog, a sausage-shaped Chihuahua named Shorty. Ted personifies the word “grizzled”—a thick head of gray hair, white beard, shrewd hazel eyes. He worked for 30 years as a gandy dancer, maintaining railroad tracks in Connecticut and New York. When I asked why he moved here to a trailer 11 feet from the bank of the Hudson River, he gave me a wry look and said simply, “Cheap.” In 1999, he bought his trailer for $5,000. He rents the land it sits on for $385 a month. The trailer is raised a few feet off the ground, and a metal skirting covers the insulation and utility pipes running underneath. “I figured I could live off my retirement without suffering too much. So here I am,” he says, jerking his head toward the river at the back of the trailer. It’s a precarious place to be. The only economic protection for residents unsheltered by the wall is something called the National Flood Insurance Program. Congress created the NFIP in 1968 to identify and map floodplains across the country, help local communities manage floodplain development, and provide flood insurance for homeowners. At the time, most private insurance companies refused to provide flood policies, which were considered too risky to be profitable. Flood insurance still isn’t profitable, but the NFIP has always been able to borrow money from the federal government if the premiums paid into the system fail to cover claims. Until a decade ago, it repaid fairly quickly. But after the 2005 hurricane season—Katrina, Rita, and Wilma—the NFIP borrowed $18 billion that it hasn’t yet repaid. After Hurricane Sandy, the program exceeded its authority to incur Treasury debt and had to seek congressional approval to borrow an additional $9.7 billion. Climate scientists predict that a combination of factors, including warming oceans, rising sea levels, and increasing atmospheric temperatures, will spawn hurricanes with higher rainfalls, more intense winds, and stronger storm surges—in short, more destructive force. After 2005, the NFIP’s problems were beginning to look permanent. Then, in 2011, Tropical Storm Irene struck Troy. A landslide trapped three families in their homes. The Ida Lake dam breached. Six bridges were overtopped by rushing floodwaters and had to be closed. While Reeves was working on the dam breach, a supervisor from a rural town to Troy’s east called to warn him that two 150-gallon propane tanks had fallen into the canal and were rushing toward the dam. “Oh my goodness!” he recalls thinking. “If they go over the dam and hit the rocks, that could be it!” But the swollen floodwaters acted as a cushion, protecting the tanks from damage as they swept over the dam, down a waterfall, and out to the Hudson River. The water rose above the seawall downtown, and marina docks tilted at a 60-degree angle and broke loose. 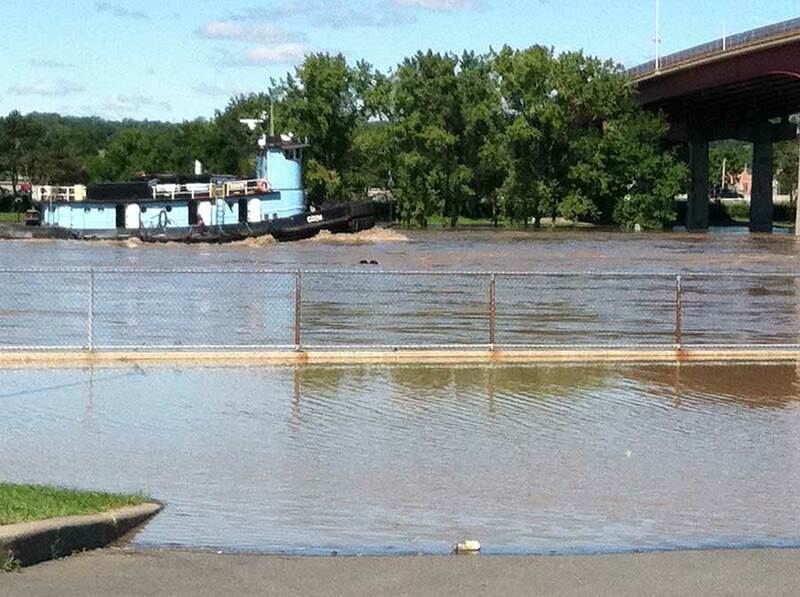 Near Ted’s trailer, the Hudson overtopped its banks and spilled across the narrow residential strip into the street. In South Troy, my partner and I were watching It, the 1927 Clara Bow film. We kept a nervous eye on the canal, where the water was ominously close to reaching the top of its cement embankments, but the rain had started to taper off. Around 7:30 pm, we were startled by a pounding at our door and the sound of police loudspeakers outside our windows. We were under mandatory evacuation. Shortly after we left, a surge of water topped the Poesten Kill’s embankments and swept down Ida Street, filling basements with murky water. At 7:45 pm, former Troy mayor Harry Tutunjian tweeted: “Poestenkill dam is in danger of breaking. It would cause tremendous damage. Long night ahead. 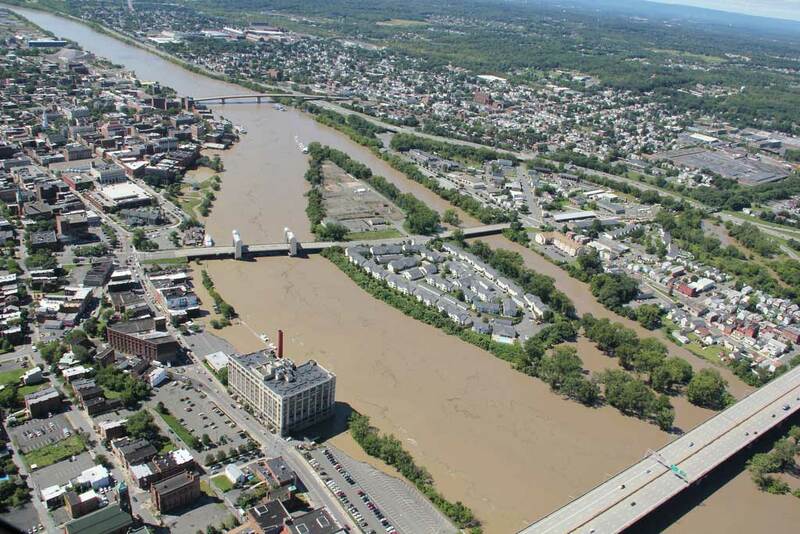 Be careful.” At 11 pm, with the floodwaters still rising, Reeves started to plan the evacuation of nearly 500 prisoners from the Rensselaer County jail. All of the city’s emergency calls were routed through the jail’s communication system. If it flooded, the city would lose its 911 capacity. In the end, though, South Troy got lucky. The storm resulted in massive property damage, but the landslide didn’t kill anyone. The dam breached, but didn’t fail. The propane tanks crashed through a rocky gorge, but didn’t explode. The floodwaters never reached the county jail, and the city’s 911 call center continued to function. At my house, the basement filled with water, but the flood didn’t reach the electrical box and the sewer line didn’t rupture. Though we didn’t have flood insurance, the Federal Emergency Management Agency was very responsive and provided about $5,000 toward replacing our water heater and furnace, which had been damaged beyond repair. I was grateful for the help, and I also learned my lesson. I purchased flood insurance in April 2012, tightening our household belt to find an extra $900 a year. Ted got lucky, too: The water came up to the top of his skirting, but didn’t enter his home. Watching southern Louisiana begin to recover from devastating rainstorms this week, I could only think: What would have happened to Troy if Irene had remained a Category 3 hurricane rather than weakening to a tropical storm? What if we had received 25 inches of rain, like Baton Rouge, instead of five? It wasn’t until 2013 that my neighborhood’s luck ran out. Those of us who could afford flood insurance received letters from our providers that, due to changes in the NFIP, our premiums would be changing from “subsidized” to what they called “actuarial” levels. In order to maintain our coverage, we would need to hire surveyors to measure our homes’ exact elevation, which would then be used to recalculate our premiums. The program changes were an effect of the Biggert-Waters Flood Insurance Reform Act of 2012, which adjusted premiums to more accurately reflect risk in the face of a changing climate. Biggert-Waters was the first comprehensive attempt to respond to an ongoing debt crisis in the NFIP. A federal program that offers affordable, subsidized flood insurance may have created perverse incentives for relatively wealthy people to build and rebuild in scenic areas. The Biggert-Waters Act responded to the popular perception that flooding happens mostly on the coasts and to wealthy homeowners. In a 2014 series in Grist, for example, Greg Hanscom complained that “Richie Rich” homeowners choose to live in coastal floodplains and then expect a bailout when their beach homes get inundated. But the NFIP doesn’t only affect the owners of second homes with ocean views, and flooding isn’t just a coastal problem. As the catastrophic events in Louisiana have made abundantly clear, flooding affects those who live inland, in river valleys, particularly in older cities that grew up around waterways—cities like Buffalo, Pittsburgh, Louisville, St. Louis, Memphis, Baton Rouge. Cities like Troy. It is not the affluent who are most vulnerable in river-valley cities and towns. Poor and working-class neighborhoods have historically developed where inland-flood risk is the greatest. Biggert-Waters put flood insurance out of reach for working families by raising their premiums without consideration of home value, coming close to causing a new wave of home foreclosures in communities still struggling to recover from the Great Recession. After paying $500 out of pocket for an elevation certificate, my flood-insurance premiums jumped to $5,200 a year—on a house with a mortgage of $388 a month. I simply stopped paying. We’d go back to taking our chances. But many of my neighbors, like Mike LaMountain, a retired truck driver who has lived on the canal for more than 30 years, didn’t have that choice: His flood-insurance premiums are rolled into his mortgage payments. A sharp increase in the cost of flood insurance would ruin him. “I’d have to sell the house,” Mike says. “I couldn’t afford it.” Of course, if flood-insurance premiums drive the cost of our mortgages above the asking price for our rapidly devaluing homes, none of us will be able to sell. In their defense, legislators recognized immediately that Biggert-Waters was fatally flawed, and the law was significantly modified in March 2014 by the Homeowner Flood Insurance Affordability Act. The most sweeping provisions of Biggert-Waters have been slowed, creating a more gradual increase in premiums, and an affordability study has been ordered. But in a working-class area like South Troy, even modest increases will have devastating effects. Here’s the deadly double bind in South Troy and communities like it: Raising insurance premiums may be necessary to stabilize a flood-insurance program overwhelmed by our new era of climate change. But increasing premiums robs low-income families of whatever wealth they’ve managed to accumulate in flood-vulnerable homes. Either way, the program fails to respond to the new reality imposed by our changing climate: Poor and working-class people live unprotected in a path of destruction. Our widespread failure to invest in solutions to the crisis created when extreme weather collides with economic inequality could be called “climate redlining.” It’s the inverse of real-estate redlining, the practice by which the US government refused to back loans in African-American neighborhoods—demarcated by red lines on real-estate maps—thus barring black families from the greatest federally backed wealth expansion in US history. Rather than drawing lines of explicit exclusion, climate redlining functions through predatory inclusion. Here’s how it works: In cities like Troy, governments underinvest in poor neighborhoods because their residents lack the political power to push for protection. In 2014, Troy passed a $2.25 million bond measure, intended to supplement the $6.75 million in federal investment from FEMA, to repair the seawall. But the seawall only protects the city center, home to the gentrifying downtown arts district and waterfront redevelopment. Because we’re beyond the seawall, North and South Troy are extra vulnerable to climate-change catastrophes like flooding. The wall stops water from entering downtown by pushing it, like the prow of a ship, to either side, turning our neighborhoods into sacrifice zones. Additionally, in South Troy, despite a 2012 engineering report declaring it in “unsound” condition, the dam that breached during Irene has gone unrepaired. Federal policies like Biggert-Waters then encourage homeowners to abandon flood-prone neighborhoods by raising insurance premiums so high that they’re impossible to pay. Those who can afford to move get out. Those who can’t are stuck without adequate infrastructure or the security of attainable insurance. Finally, real-estate capitalism kicks in. Filling the gap in affordable housing in small historic cities facing gentrification pressures, landlords buy up abandoned buildings in climate-vulnerable neighborhoods for cash and offer them as low-cost rentals. Because homes bought for cash carry no mortgages, there’s no requirement that they carry flood insurance. The result of this process are hypervulnerable climate slums. The vulnerability of poor and working-class neighborhoods to natural disaster will worsen as climate change advances. The National Oceanic and Atmospheric Administration warned in June 2015 that “the numbers of very intense (category 4 and 5) hurricanes will increase by a substantial fraction” in years to come. Environmental scientists caution that what were once known as 100-year floods will become 10-year floods by midcentury. Climate redlining is thus a nationwide catastrophe waiting to happen. 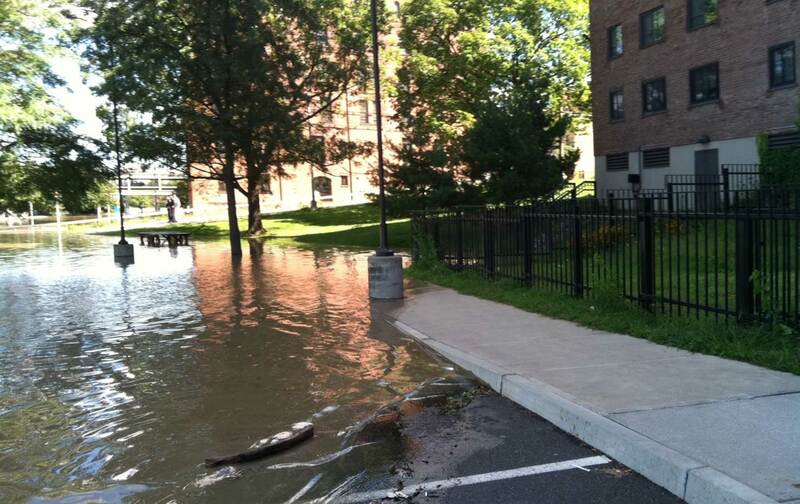 Troy’s poor and working-class neighborhoods came within a hair’s breadth of total disaster during Tropical Storm Irene. There are hundreds of older cities and rural communities in the United States built along waterways—and each faces the potential for cataclysmic flooding of rivers and canals. How do we respond to the reality of rising waters without encouraging climate redlining? Reassuringly, efforts to plan for climate justice—to design solutions to climate change rooted in the reality of disproportionate impact—are growing. For example, the New York City Panel on Climate Change’s 2015 report confirms that the old and the very young, women, the mentally ill, those who lack physical mobility, and the poor all suffer from climate-based trauma at higher rates than the general population. The Black Lives Matter movement explicitly links racial justice and climate justice, citing the fatalities of Hurricane Katrina and the weeks of suffering in Red Hook, Brooklyn, after Superstorm Sandy. Back in Troy, we’ll probably be the last owners of our charming, crumbly house, which has stood at a crucial intersection of a lively working-class neighborhood for more than 150 years. I’ve had to work hard—emotionally and practically—to be OK with that. The fact that my house might be valueless in a handful of years will financially devastate my family, of course. But it’s the potential death of my neighborhood that fills me with the most profound sorrow. If my mortgage—or my house—ends up underwater, I’ll recover: I can return to a well-paid academic teaching job, or ask my family to forgive my debt. It would be fiscally wisest to pull up stakes and sell now, before the federal flood policy is settled. Like working-class urban whites of the 1950s, we’re being tacitly encouraged to flee our homes and neighborhoods in the face of society’s failure to imagine collective, equitable solutions to big social problems like racism, classism, and climate change. In the end, we might need to make a heartbreaking retreat from the floodplains. The challenge is: How do we make it together? Climate redlining is not a problem that can be solved one household at a time. The interlocking crises of climate change, failing federal safety nets, and neglected infrastructure are the result of shared political decision-making, not bad choices made by people living in floodplains. Poor and working-class communities aren’t responsible for the changing climate, but we are being asked to pay the price, with our money and our lives, when the waters rise. Virginia EubanksVirginia Eubanks is the author of Digital Dead End and the coeditor of Ain’t Gonna Let Nobody Turn Me Around: Forty Years of Movement Building With Barbara Smith. She is a Ford Academic Fellow at New America.